I am a Nigerian, have a brother who is now a British citizen and a sister who just become a resident of UK. I have been refused four times now for UK visas in different situations. 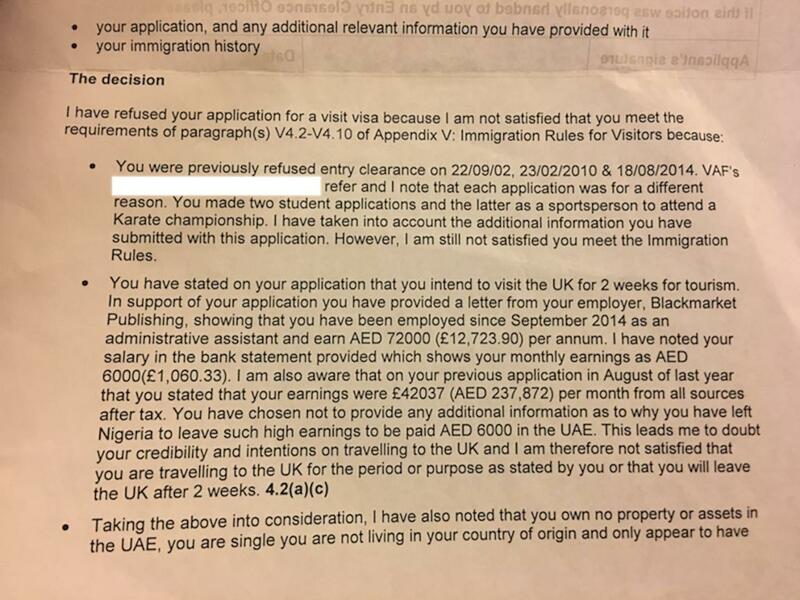 I was denied twice for student visas due to little errors from my end in 2002 and 2010. Then I was denied in 2014 (I used one stupid and foolish agent for the application which was out of ignorance). The 2014 application was for karate competition. I did the application with my wife (then my fiancé) and we were both denied and the reason was economic crises because it was during that Ebola time. We didn’t see the forms filled to know what the agent wrote for us nor did we see the refusal letters. I have been working in UAE since 2014 (after the third visa refusal, the agent's own) and have travelled to Kenya, South Africa, Turkey, Italy and Spain (all these visas I got in Dubai based on my residence there). 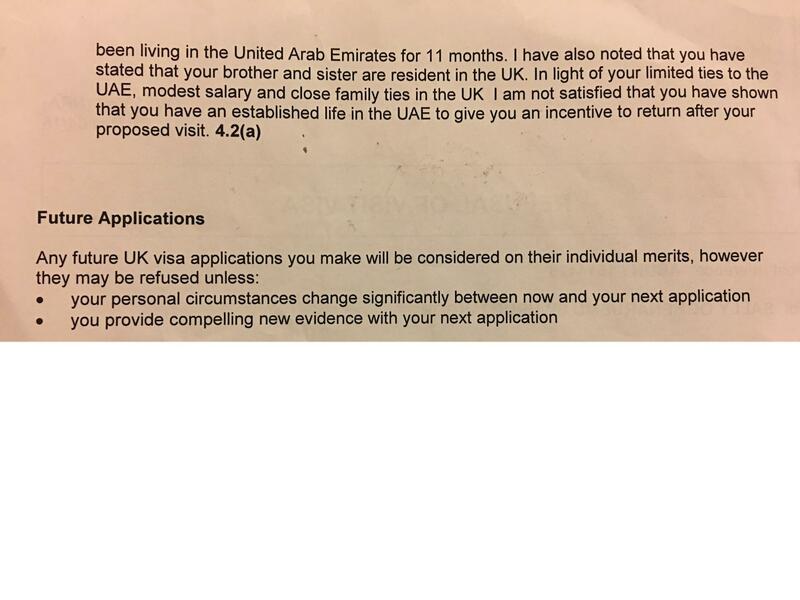 I then applied for UK again from Dubai and was refused. I have attached the last refusal letter to this post and don’t laugh on the salary part because the agent finished me. Anyway the way forward now is this: I have countered most of their reasons for the last refusal as I am now married, have been working in the UAE for almost two years, now receive 7,000 AED, my wife is a UAE resident too and we both have been to Italy and Paris last month. I intend applying from my home country next. My wife has a friend who is a doctor and a British citizen who just got married this month and wanted to invite us to come over for the wedding but work didn’t permit me. She is suggesting that we come over for Christmas and she will be inviting us but she is suggesting an agent to package the application for us but I AM SERIOUSLY REFUSING AND WOULD not AGREE so ALL my visa application is done by me for me, so I can defend whatever information is there. How do I package this application? I intend using my salary bank account statement from UAE and also my tenancy agreement there. My life insurance saving with my bank in the UAE. My land deed in Nigeria, letter from my employer that am going on the trip and additional documents. I am thinking of drafting a letter to confess my sins on my previous bad application (the agent's own). Is this an ideal thing to do? Is there a format for such letter? Will it be better to go with the invitation from my wife’s friend or it is better to apply like a tourist? The refusal notices will be different, but it's no longer about substance. At this point it really doesn't matter what specific reasons they are giving, serial refusals take on a life of their own when UKVI's decision-makers decide that you have a fixation on entering the UK. Once that happens they will begin using the dreaded 'discrepancy method'. You have been experiencing it in your various applications, but probably didn't have the 'academic' term for it (as defined by Gina Clayton). Your question is not a total duplicate because you reveal that you have been using an 'agent' to manage your applications. This is a mistake that should be rectified before even considering another application. We don't know enough about your 'agent' to know if you have been scammed, it's sufficient to know that your 'agent' is not a regulated one (or they would have put the brakes on a long time ago). So short and sweet. And knowing that the linked question is providing a canonical answer about serial refusals, I can sign post you to a brochure published by the Commissioner: "Risks of unregulated immigration advice". Advisers must be open and honest with you about your prospects of success and should only advise you to proceed with an application if you have a realistic chance of being granted leave to enter or remain in the UK. You will see that there are several bodies that can authorise a person to provide immigration services, I always recommend the UK Law Society because their members can represent anywhere from the lowest to the highest levels of the process. And to avoid confusion, the UK Law Society has corresponding members all over the planet (they are not solely British and not solely UK-based). You can use the search facility at ILPA to find an appropriate one for your own situation. Reading the officier's reply to your application, I deem this a lost cause. Being Nigerian is already not the greatest starting position for being admitted to the UK to begin with. After all "keep Africans out" was one of the main reasons a lot of people voted for Brexit. Thus, in order to have any reasonable chance, your application should be absolutely flawless. This includes, among other things, plausibly demonstrating that you have enough assets to sustain yourself and to allow you to leave again after some weeks (and, enough assets abroad to be motivated to leave!). Because, let's be honest, they might allow you limited entry, but they don't want you to stay. The officer's reply, while very polite and very factual, is also very clear. It says nothing but: "You liar!" (in very polite words). Whether or not you are actually being truthful, or whether or not there is maybe only a misunderstanding really doesn't matter an awful lot now. From what will be recorded in your file ("rejected 4 times, untruthful"), you are burned. The next officer receiving your next application will 99.99% certain enter your name into the computer, see this note, and close the application. In the officer's opinion, you made non-credible, doubtful statements about your earnings, in particular he found it surprising that someone earning £42,000 per month after tax in Nigeria would move to the Emirates for no apparent reason to earn £12,000 per year. You will admit that all in all, this indeed looks a bit "strange" without further explanation. The 99th percentile is at 108k in the UK, which means less than 1% of the population earns more than 108k per year. Your claimed salary in Nigeria was almost 5 times as much (4 times as much as the Prime Minister!). So basically, you must be the richest man in Nigeria, or something. It is rather safe to assume that someone with such a salary would not go working as EA for some unknown publishing company. Not unless there is a very, very, very urgent, compelling reason to do so, which you did not provide. I am guessing that most likely there was simply a mistake somewhere in your numbers (maybe you confused monthly with yearly salary or GBP with AED, or both), but whatever it is, it doesn't matter now. The officer concluded this looked way too suspicious, and that's it. The officer also wasn't convinced that you had assets (a house?) in the Emirates which would motivate you to leave UK again. So, although it says "future applications will be considered based on their individual merits", I think this is merely a flowery phrase, your case is pretty hopeless. Not the answer you're looking for? Browse other questions tagged visas uk visa-refusals nigerian-citizens serial-refusals or ask your own question. Schengen visa and previous refusals? Can I apply for an Australian visit visa within 7 days after getting refused once?